Dr. Zhang is an Associate Professor in the Department of Epidemiology and a full member of the Indiana University Simon Cancer Center. He earned his medical degree and master’s degree in orthopedics from Xi’an Jiaotong University School of Medicine and obtained his PhD in Epidemiology from the University of Leuven. His postdoctoral training in nutritional and molecular epidemiology was completed at Utah State University. As a visiting scientist, Dr. Zhang worked in the Department of Epidemiology at the Johns Hopkins University Bloomberg School of Public Health in 1988-1989. He received further training in molecular and genetic epidemiology from Johns Hopkins University in 2001. Dr. Zhang’s primary research interest is nutritional and molecular epidemiology of cancer, with a focus on nutrient-gene interactions in the etiology of common cancers, particularly pancreatic and prostate cancers. Dr. Zhang is also interested in the identification and validation of dietary, hormonal, metabolic, and genetic factors that are predictive of precursors to invasive cancers and/or are valuable for early cancer detection. He has experience and expertise in dietary assessment and validation. Dr. Zhang has conducted or participated in several case-control and cohort studies of cancer and other chronic diseases in China, Japan, Belgium, and the USA. He has maintained close scientific collaborations with some investigators in those countries. 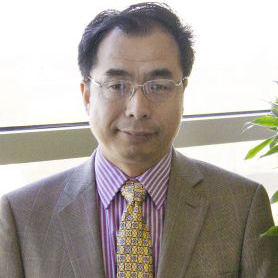 Dr. Zhang has published more than 60 original research papers in peer-reviewed journals and two book chapters. He was the first author and/or senior author of most of these papers. Since 1999, he has given more than 30 oral or poster presentations in national and international conferences of epidemiology, cancer, and nutrition. He has been the Principal Investigator on more than 10 research projects funded by NIH and other agencies and a Co-Investigator on a number of epidemiological studies supported by national and international grants. Dr. Zhang has served as a reviewer for over 20 scientific journals. He is an editorial board member of several international peer-reviewed journals, including the International Journal of Molecular Epidemiology and Genetics. He was interviewed by an editor of The Scientist (a reputable life science magazine) to discuss the effect of milk consumption on cancer risk worldwide [The Scientist, 2007;(21)3:34-43]. Dr. Zhang was the recipient of the Anafred Halpern New Investigator Award conferred by the American College of Nutrition in 1999. He was a key member of the research team that was awarded the Klaus Schwarz Commemorative Medal by the International Association of Bioinorganic Scientists in 1996. He received Indiana University Trustees’ Teaching Award in 2015. Dr. Zhang is an elected fellow of the American College of Nutrition and a member of the International Epidemiologic Association, the Society for Epidemiologic Research, and the American Association for Cancer Research. Reger MK, Zollinger TW, Liu Z, Jones J, and Zhang J*. Urinary phytoestrogens and cancer, cardiovascular, and all-cause mortality in the continuous National Health and Nutrition Examination Survey. European Journal of Nutrition 2016;55(3):1029-40. Zhang J*, Prizment AE, Dhakal IB, and Anderson KE. Cholecystectomy, gallstones, tonsillectomy, and pancreatic cancer risk: A population-based case-control study in Minnesota. British Journal of Cancer. 2014;110:2348–2353. Zhang J*, Dhakal IB, Zhang X, Prizment AE, and Anderson KE. Genetic variability in energy balance and pancreatic cancer risk in a population-based case-control study in Minnesota. Pancreas. 2014;43(2):281-6. Zhang J*, Dhakal I, Yan H, Phillips M, Kesteloot H. Trends in pancreatic cancer incidence in 9 SEER Cancer Registries, 1973-2002. Annals of Oncology 2007;18(7):1268-1279. Zhang J, Munger RG, West NA, Cutler DR, Wengreen HJ, Corcoran CD. Antioxidant intake and the risk of osteoporotic hip fracture in Utah: an effect modified by smoking status. American Journal of Epidemiology 2006;163:9-17. Zhang J*, Kesteloot H. Milk consumption in relation to incidence of prostate, breast, colon, and rectal cancers: is there an independent effect? Nutrition and Cancer: An International Journal 2005;53(1):65-72. Zhang J, Kesteloot H. Differences in all-cause, cardiovascular and cancer mortality between Hong Kong and Singapore: role of nutrition. European Journal of Epidemiology 2001;17:469-477. Zhang J, Temme EHM, Sasaki S, Kesteloot H. Under- and overreporting of energy intake using urinary cations as biomarkers: relation to body mass index. American Journal of Epidemiology 2000;152:453-462. Zhang J, Temme EHM, Kesteloot H. Fish consumption is inversely associated with male lung cancer mortality in countries with high levels of cigarette smoking or animal fat consumption. International Journal of Epidemiology 2000;29:615-621. Zhang J, Kesteloot H. Anthropometric, lifestyle and metabolic determinants of resting heart rate: a population study. European Heart Journal 1999;20:103-110.